new ACS-64 locomotives during the unveiling ceremony. 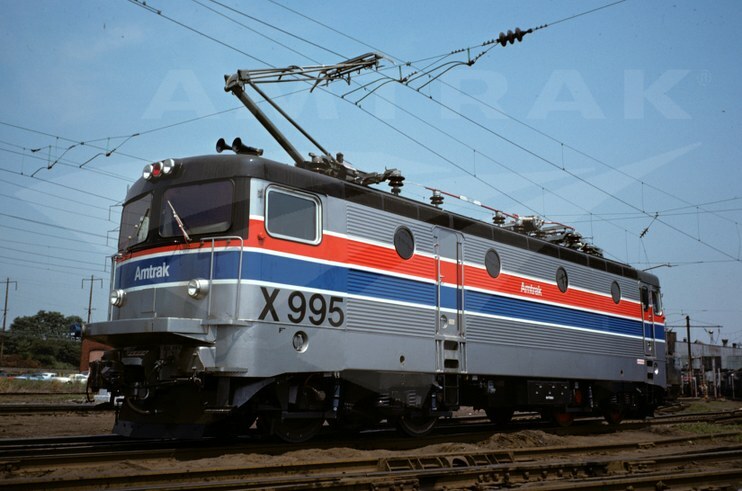 As Amtrak and railroad enthusiasts look forward to the introduction of the new electric Amtrak Cities Sprinter (ACS-64) locomotive, the Amtrak Archives continues its look back at the electric locomotives that helped make the Northeast Corridor (NEC) North America’s premiere high-speed rail line. Today, more than 2,200 intercity, commuter and freight trains operate over some portion of the NEC each day, and approximately 260 million intercity and commuter rail passengers rely on the corridor each year. By the mid-1970s, the GG-1 locomotives Amtrak had purchased from the Pennsylvania Railroad were nearing the end of their useful lives; built in the 1930s and 1940s, they had pulled trains along the NEC and Keystone Corridor for more than three decades. Amtrak thus began the search for a replacement, eventually deciding on the General Electric E-60. Based on existing freight locomotives, the boxy design gave the 70 foot long unit a solid, heavy appearance. To celebrate the arrival of the E-60s, the Amtrak national timetable issued on May 15, 1975 featured an image by noted railroad artist Gil Reid. Against a vivid blue sky, E-60 locomotive #965 pulls into the Metropark station as a Metroliner Service train glides past--a vision of modern railroading in the Northeast. featured a new E-60 locomotive. Each of the 26 locomotives ordered weighed in at 193.5 tons and could achieve approximately 6000 horsepower. Like the GG-1, the E-60 was also a dual cab design, meaning that it could be operated in either direction for a quick turn-around. The E-60s initially bore the Amtrak Phase II livery introduced in 1975. The paint scheme featured wide red and blue bands framed by slim white stripes wrapping around the locomotive. After taking over the nation’s intercity passenger rail system in 1971, Amtrak bought nearly 1,500 cars from a total pool of 3,000 held by the twenty railroads that had been relieved of their passenger service obligations. It also placed orders for new single-level and bi-level cars. Some of the older cars required conversion from steam power to electric head-end power. Since the company was in the middle of this process, a handful of E-60s were built with steam generators for the older equipment, while the majority included head-end power generators to work with refurbished cars and newer Amfleet equipment. E-60 #966 and AEM-7 #901 at the Ivy City Yard in Washington, D.C.
Intended to reach speeds up to 120 mph, the E-60 actually proved too heavy, placing great stress on the rails when operating at high speeds. Therefore, it was limited to 90 mph. Consequently, Amtrak returned to its search for a more practical replacement for the reliable, but aging GG-1s. Testing various models, the company decided upon the Rc4 locomotive built by the General Swedish Electric Company (Allmänna Svenska Elektriska Aktiebolaget, or ASEA), which became the base for the AEM-7. in 1976, became the model for the AEM-7. Considered lightweight at 101 tons and built to achieve top speeds of 125 mph, the dual cab AEM-7 became the mainstay of the NEC. 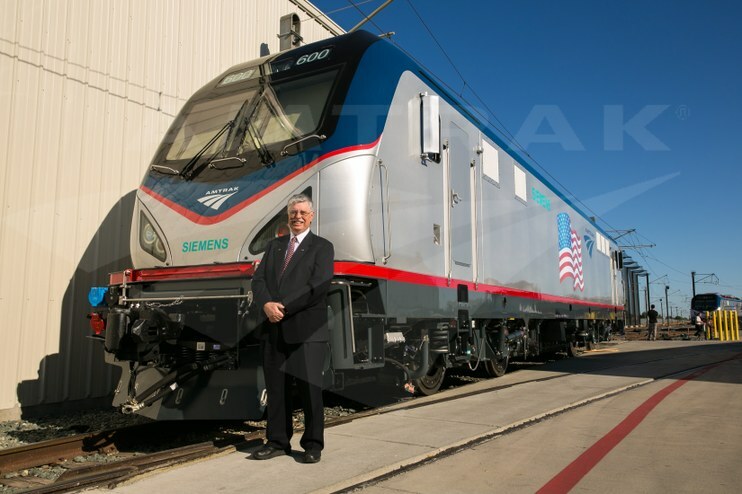 Amtrak contracted with General Motors Corporation's Electro-Motive Division (EMD) to design and manufacture the AEM-7, and the first units have carbodies built by Budd. Amtrak eventually purchased 54 of the locomotives, which were produced from 1978 to 1988. Each has 7000 horsepower and measures roughly 51.5 feet long and 12.5 feet high. Among railroad fans, the locomotive is affectionately known as a “Swedish meatball” or a “toaster” due to its country of origin and compact, boxy design. The first AEM-7s bore the Amtrak Phase III livery unveiled in 1979—joined red, white and blue stripes of equal width. Gunpowder River in northeastern Maryland. The introduction of the AEM-7s allowed Amtrak to retire the GG-1s. 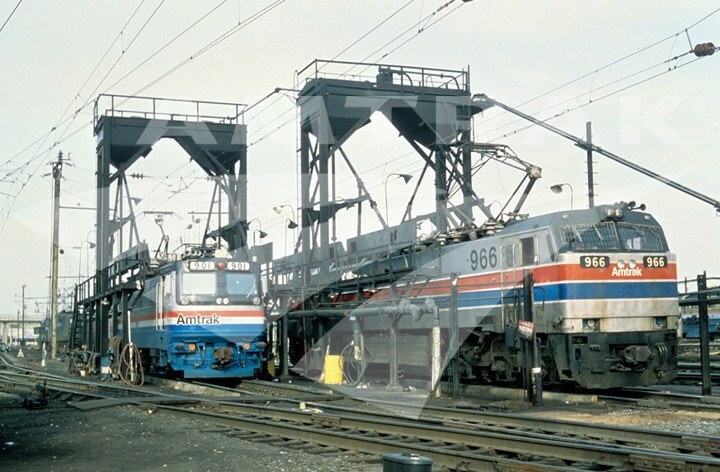 While some of the heavy E-60s were sold to other railroads at that time, the remaining units continued in service, operating primarily on long-distance trains between New York and Washington and Clocker trains between New York and Philadelphia, until the last E-60s were retired in 2003. Amtrak donated an E-60 to the Railroad Museum of Pennsylvania in 2004, making it one of the few to be preserved. In the early 2000s, 29 AEM-7s were converted to AC power under a partnership between Amtrak and Alstom. 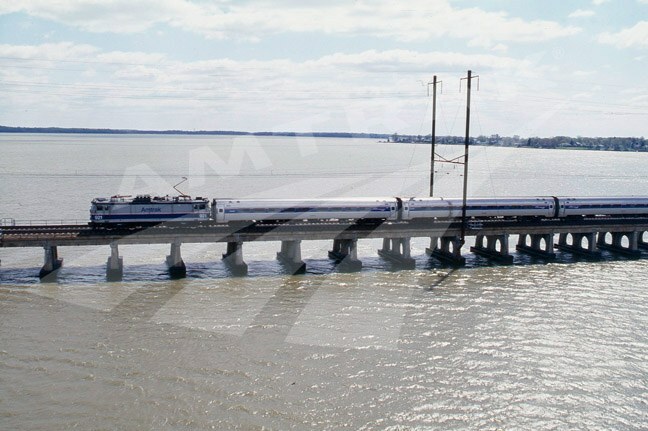 The latter designed and built the propulsion and auxiliary power systems, and Amtrak prepared the carbodies and trucks to include painting and the installation of new cables and cab control consoles. The end result was remanufactured units that required less maintenance, provided greater reliability and had the ability to haul longer trains. 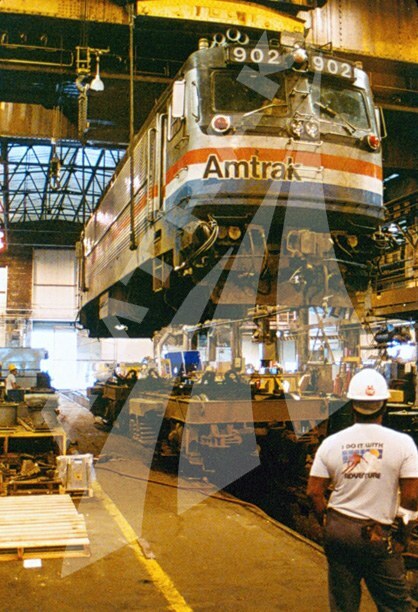 AEM-7 #902 undergoes repairs at the Wilmington, Del. Concurrent with these improvements to the AEM-7, Alstom was also building the HHP-8 locomotive. These 15 units were needed to supplement the AEM-7 fleet following the completion in 2000 of the Northeast High-Speed Rail Improvement Project, a program to electrify the New Haven-Boston portion of the NEC. Based on the design of the Acela Express power car, the HHP-8 can achieve a top speed of 135 mph. It has 8000 horsepower and features regenerative braking, meaning that energy generated during braking is returned to the power grid for greater efficiency. For a new generation of rail fans, the AEM-7 became the face of a rebuilt and enhanced Northeast Corridor, which resulted from the multi-year, federally funded Northeast Corridor Improvement Project. Working with the Federal Railroad Administration, Amtrak improved infrastructure such as tracks, bridges and power systems to increase top speeds and cut trip times between Washington and Boston. If the GG-1 represented the initial electrification of the rail lines between New York and Washington and Philadelphia and Harrisburg, the AEM-7 was a worthy successor for a new era. Today, the AEM-7 fleet has logged in excess of 200 million miles and will be retired as the new ACS-64 locomotives come online through 2016.